Today’s agenda includes major news such as US Philadelphia Fed Manufacturing Survey (Previous: -4.1%, Forecast: 4.5%), US Initial Jobless Claims (Previous: 229K, Forecast: 225K) and Continuing Jobless Claim (1.776M, Forecast: 1.772M). Traders should keep a sharp eye on the news, because it is expected high volatility during the US session. Reviewing the daily technical aspect, EURUSD broke yesterday the trendline (T1) to the upside rallying to around 1.145 level. 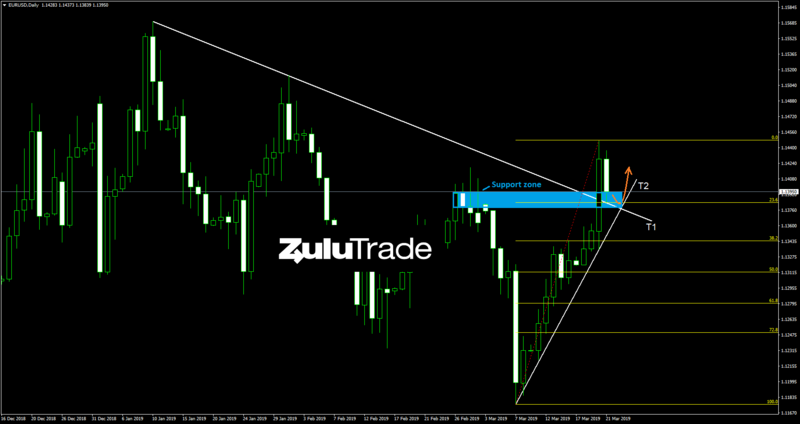 Currently, the pair is moving within the support zone, between the trendline (T1) and trendline (T2). Earlier in the day, EURUSD hit also the 23.6% Fibonacci support level. Overall, the setup indicates a potential reversal of today’s bearish momentum towards 1.15 level. On the other hand, if price breaks out below the trendline (T1), then the Bears may push the pair lower towards the 38.2% Fibonacci level.